Breast augmentation, also known as augmentation mammoplasty, breast enlargement, or breast implant surgery, is a surgical enhancement procedure designed to accentuate the size and shape of a woman’s breasts. Breast enlargement is the number one surgical cosmetic procedure worldwide being popular with women of all ages. 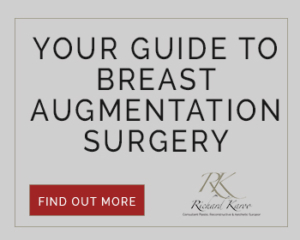 For those seeking breast enlargement in the South Wales area, Mr Richard Karoo aims to provide a beautiful, natural-looking enhancement that will have a positive effect on your self-esteem. Mr Richard Karoo offers a bespoke tailor-made surgical procedure with a wide range of high-quality implants that have an excellent safety record, in all sizes, both round and anatomical that can be inserted both above and below the muscle, ensuring that you get the perfect shape for you. The surgery is commonly performed as in inpatient procedure with an overnight stay to help ensure you are well and comfortable after your surgery and anaesthetic. Breast implants are typically composed of silicone gel encased in a silicone shell. The contents of these implants are described as a cohesive gel, this means the consistency is more like a jelly rather than liquid. In some circumstances, particularly those requiring breast reconstruction an inflatable implant may be used to allow the surgeon to adjust the level of inflation to attain breast symmetry and balance. Surgery typically lasts from 1 to 2 hours.